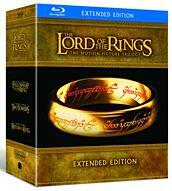 HDD Spotlight Bargain: 'The Lord of the Rings: Extended Editions' Blu-ray $64.99 at Best Buy (U.S.), Future Shop (Can), Amazon (Can)! The long-awaited precioussssss is on sale at a bunch of different retailers! Both Best Buy and Amazon are selling 'The Lord of the Rings: The Motion Picture Trilogy - Limited Edition Extended Editions' for $69.99 (42% off the suggested list price), but with the Best Buy $5 off coupon (in-store only) the set is only $64.99. For our Canadian readers, both Amazon Canada and Future Shop are selling it for $64.99 as well! Also according to forum member LordoftheRingsEE, Wal-Mart Canada should be selling the Blu-ray box set for $59.83 June 28-30! Don't miss out on these great sales for one of the most anticipated releases of the year!